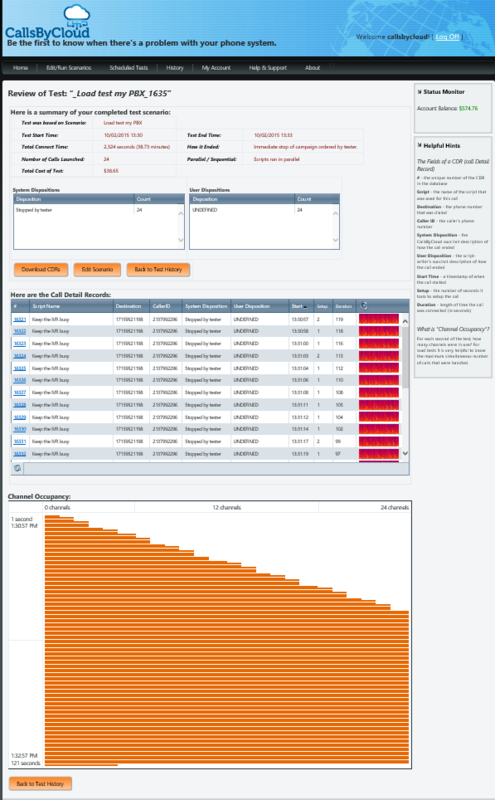 In a previous post about busy/release of CDR, I asked if anyone was curious about capturing CDR from Avaya Communication Manager using a Kiwi Syslog server. At least one of you was, so here it is. There are two parts of course. One part is programming the phone system to send CDR. And the other part is programming Kiwi to capture CDR. These can be done in either order, but if you program the phone system first, the CDR buffer will fill as is tries to establish the connection with Syslog. So let’s start with Kiwi. Your version may differ. In my case, the network team already had a rather powerful installation of Kiwi on some great hardware. All I had to do was configure it to capture Avaya CDR. So when you launch the Kiwi dashboard, click File->Setup and in the “Server Setup” window, scroll to the bottom for “Inputs”. In the TCP section, tell Kiwi to listen for TCP messages on whatever port you wish. I’m using 5013 – probably because I saw it in an Avaya doc somewhere. But you can use any port. 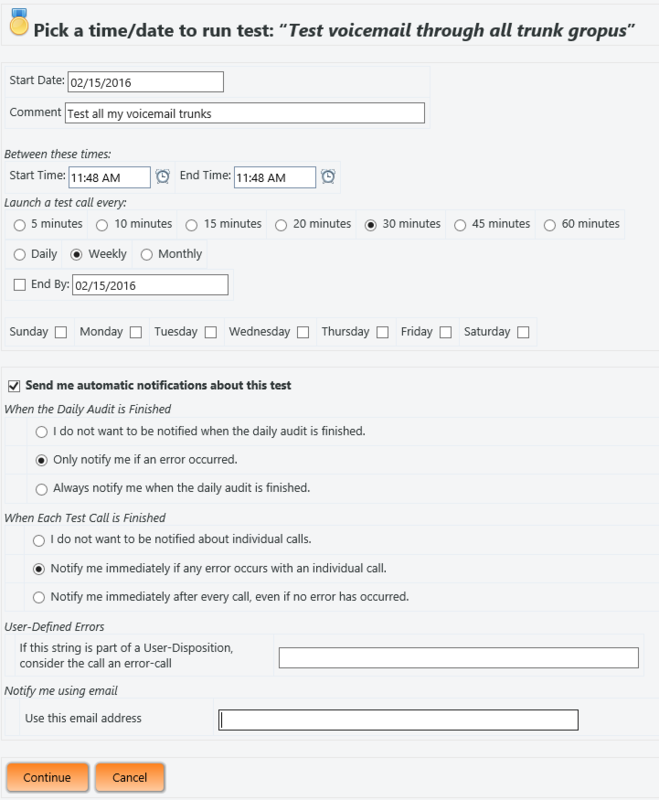 Then scroll up to the “Rules” section and configure a new rule to match for messages from your Avaya Communication Manager. In my case, I named my rule “Call Records from LA PBX”. I set a filter by IP address. If you also send any other information to Kiwi from the CMs, then you’ll want to filter by the Priority field. You want the Local7 field to be Debug. I don’t recall why this works. 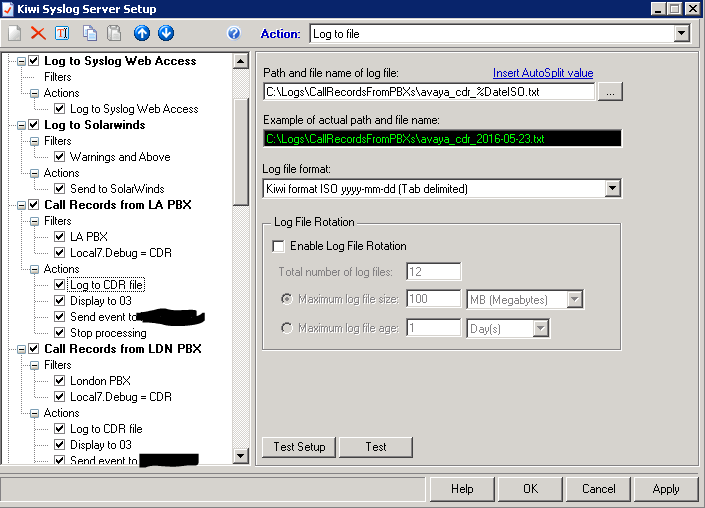 I think I was looking at the data one day to try to separate the CDR from the other syslog messages from Avaya and this seemed the easiest way to do it. Now, if we program our PBX correctly, we should get CDR to these text files! Programming the Communication Manager is three steps: Add the node-name, set the ip-services, and change the system-parameters cdr. To set the node name, ‘change node-name ip’ and create an entry for the IP address of your Kiwi server. This is basically the DNS lookup for the CM. This sets the name and IP address. Any name will do. Enter the IP address of your Kiwi server. Next, set the ip-services. I have squeezed all three screens here. The important thing here is page three. We need to set the “Reliable Protocol” to n. I think Avaya defaults this to y and it works great for their pre-packaged CDR partners. For home-grown syslog, we set this to n. It may not hold up in court if there’s ever a dispute. And last step – set the system-parameters for CDR. Here’s the thing. You have lots of options here. You can define fields, separators, etc. But I discovered that there is a line length limit that is not obvious. 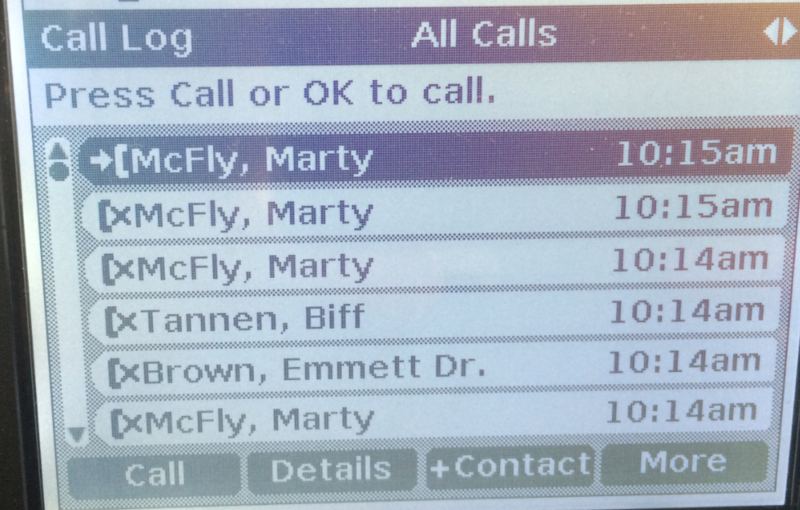 Also, the caller-id name is surprisingly absent. Rather than customize the CDR, I have gone back to “unformatted” and let further processing figure it out. I have a perl script that parses unformatted cdr. Anyone want to see it? The good news here is the link state(s) are “up” and the CDR buffer % full is 0. 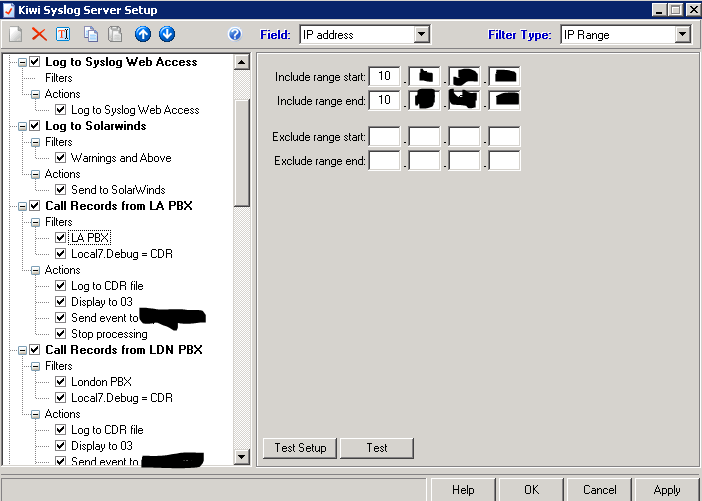 If you have trouble, you can “busy cdr primary” and “release cdr primary” to close and open the socket. You should see a blip in the Kiwi server when this happens. Make a call and watch Kiwi! You may need to check the log files rather than rely on the Kiwi display. The extra CR/LF will sometimes make Kiwi look funky but the text file is usually just fine. This entry was posted in Avaya, Avaya Stuff You Should Know, pbx, voice on May 23, 2016 by roger. I have had this problem in three offices starting in 2013. And it just happened to me today in an overseas office. 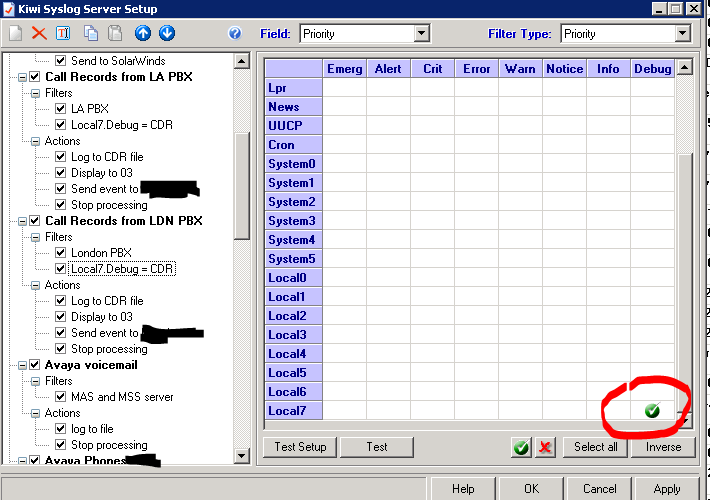 This problem can remain hidden in your telephone system for years and not be a problem because it’s so rare for a phone to get assigned a new IP address via DHCP. Basically, a phone reboots for some reason. When it comes back up, there’s no dialtone. Or, if you have more than one gateway, you might get intermittent dialtone. 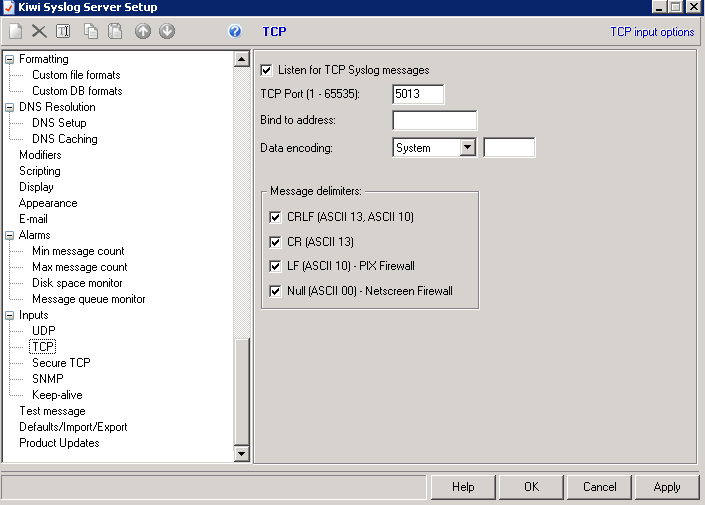 That IP address on the third line – that’s the gateway assigned to serve dialtone for this call. In my case, I have a gateway in the local office, and a gateway in the datacenter. Whenever the user said “hey, there’s no dialtone!”, it had drawn a resource from the local gateway in the same subnet. The phone worked in all other ways – there was just no media. There are MILLIONS of Avaya forum postings regarding no dialtone, one-way audio, etc. In my case here, the problem was caused by the arp cache in the G450 gateway. That’s pretty obscure. The IP address changed, but the MAC address in the arp cache did not change. So the gateway is trying to feed dialtone to the wrong MAC address. That fixed the issue of no dialtone. It did not fix the issue of phones rebooting and getting different IP addresses though. I will write a different post for that, since it was a completely unrelated issue. I hope this helps! Please let me know if this works for you. This entry was posted in Avaya, pbx on May 23, 2016 by roger. I recently had a strange issue with my utility servers. I have four of them on System Platform on the S8300D servers. But I was unable to log into any of them as cust nor admin. I could log into my standalone utility servers, but not the ones on system platform. If this were to happen again, you can verify if the account works by attempting login to SSH of Dom0 or Cdom or webconsole of Cdom. If it works there, then we know that LDAP configuration is corrupted and needs to be corrected. If it happens again, have a ticket open stating that LDAP is corrupted on VUS and that /etc/ldap.conf and /etc/nsswitch.conf need to be fixed.